Rosamund's baseball team has a very unusual second base - Oliver's gloopy purple plastic octopus. But one morning... it's gone! 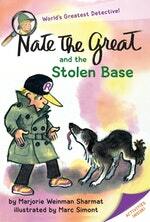 'Somebody stole second base,' Rosamond tells teammate Nate the Great. With the help of his dog, Sludge, the young detective trails the missing octopus, picking up clues along the way. It's not easy to track down a stolen base, and Nate's hunt leads him to some strange places before he finds himself up at bat once more. Love Nate The Great And The Stolen Base? Subscribe to Read More to find out about similar books.